Do carbohydrates and sugar make yeast worse? The short answer is yes and no! To understand this, we need to learn a little about yeast. Yeasts are members of the fungus kingdom and constitute about 1% of all described fungal species. By fermentation, the yeast species Saccharomyces cerevisiae converts carbohydrates to carbon dioxide and alcohols – for thousands of years the carbon dioxide has been used in baking and the alcohol in alcoholic beverages. Other species of yeasts, such as Candida albicans and Malassezia pachydermatis are opportunistic pathogens and can cause infections in humans and animals. 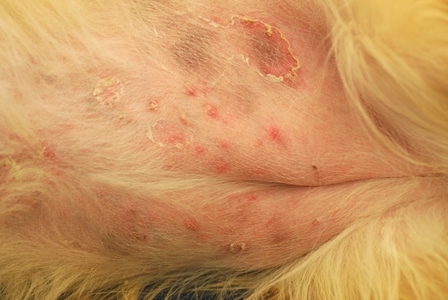 In dogs, the most common species of Malassezia causing skin disease is Malassezia pachydermatis. Unlike other yeasts that use sugars as their food source (Saccharomyces and Candida) Malassezia feeds on fats. Because Malassezia depends on fats rather than sugars and because it lives on the skin, NOT in the intestines, it is unaffected by sugars and carbohydrates that are consumed in the diet. So, the answer to the first question is NO for Malassezia, but may be YES for Candida. Candida (a common cause of yeast infections in humans) does live on sugars in the intestines and therefore may be affected by carbohydrates and sugars in food. Malassezia is naturally found on the skin surfaces of animals, including humans. There are many different species of Malassezia yeast. Each animal species (or human) has their own common types of Malassezia yeast. Although a norma inhabitant of skin, Malassezia can cause infections. Malassezia infections can cause changes in skin color- either lighter or darker. Malassezia yeast is a common cause of dandruff and seborrheic dermatitis in humans. The skin rash “tinea versicolor” (pityriasis versicolor) is also due to infection with Malassezia yeast in humans. Malassezia is a very common cause of skin disease in our pets. Malassezia causes itchiness, redness, dark skin, “elephant skin,” excessive scaling (dandruff), and bad odor. Most often, pets develop Malassezia infections due to underlying allergies (such as flea allergy, food allergy or environmental allergies). However, people and pets can develop allergies to their own normal Malassezia yeast flora (the yeast population that normally lives on their skin). It is essential to completely control Malassezia infections. 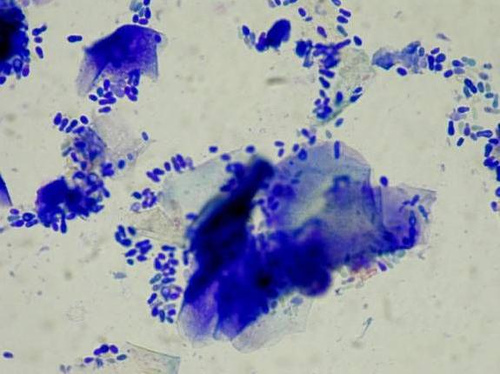 Cytology is needed to confirm the presence of yeast on the skin. Typically, a combination of oral and topical therapies will be recommended to treat the infections. Bacterial Skin Infections - Does My Pet Have MRSA?! The majority of bacterial skin infections in dogs and cats are caused by an organism called Staphylococcus pseudintermedius. This specific type of Staph. is actually part of the normal bacterial flora of the skin in dogs and cats. Staph. pseudintermedius can be found in healthy dogs and cats, on their skin, in their ears, and even in their mouths. Staphylococcal skin and ear infections in dogs and cats are considered opportunistic infections, meaning these normal skin/ear inhabitants only cause an infection when they have an opportunity to do so. These opporunities arise when the skin is affected by another disease process such as allergies, or when the immune system is not fully functional (immune suppression). Staphylococcus aureus is a different species of Staphylococcus. It can be part of the normal skin flora in some people. Staph. auerus is not considered normal flora in dogs and cats. MRSA stands for methicillin resistant Staphylococcus aureus. Methicillin resistance is a term that indicates resistance to a large group of antibiotics called beta lactams. The beta lactam group of antibiotics includes several well known antibiotics such as amoxicillin, cephalexin, and others. Beta lactam antibiotics such as cephalexin are often prescribed for treating skin infections. Any type of Staph. can aquire this type of antibiotic resistance, so the term “methicillin resistant” can be used to describe any Staph. that becomes resistant to the beta lactam antibiotics. Antibiotic resistance is diagnosed based on bacterial skin culture and antibiotic susceptibility testing. This is a simple and painless test; once the sample from your pet is submitted, it takes about 3-5 days to receive test results. When we culture antibiotic resistant Staph. skin infections in dogs and cats, the most common bacteria grown is methicillin resistant Staphylococcus pseudintermedius, or MRSP. True MRSA skin infections in dogs and cats are actually pretty rare. Our dermatologists here at Animal Dermatology & Allergy only culture MRSA from our patients at most once every couple years. MRSP infections, on the other hand, are something that we diagnose more often. It is very important to remember that not all methicillin resistant Staph. organisms are MRSA! This distinction is important because Staph. aureus is adapted to live on humans, whereas Staph. pseudintermedius is not. This means that MRSA infection in a pet does pose a slightly higher risk for transfer of the infection to humans as compared with MRSP infection in a pet. However, the risk to humans is still considered low for both MRSP and MRSA infections in pets. Remember that Staph. skin infections in both people and animals are considered opportunistic infections. If your pet is diagnosed with a methicillin resistant Staph. skin infection, there are some simple precautions you can take. Excellent handwashing hygiene practices are probably the most important step in reducing the risk of transferring Staph. from your pet to yourself. Additionally, you should minimize contact with the infected areas on your pet. Please click on the links below for some great information about MRSP and MRSA, as well as a more detailed list of precautions that can be taken in case your pet is diagnosed with one of these infections. If you have any special medical needs or health conditions, it is always a good idea to consult with your physician about specific recommendations pertaining to your personal situation. Please check out last month’s blog post for more information on treating bacterial skin infections in dogs and cats. The links below will also take you to some excellent information on MRSP and MRSA infections in pets. If your pet develops a bacterial skin infection, it is most likely an indication of any underlying dermatological problem. Dogs and cats develop bacterial skin infections as a result of other disease processes affecting the skin itself. Diagnosing and treating skin infections is an important step in making sure that your pet’s skin disease is appropriately managed. Having the veterinarian obtain samples from the skin for cytology (microscopic examination) is imperative. Just because your pet is crusty, bumpy, and smelly does not always mean they are infected. Cytology will determine whether your pet truly has a skin infection. If your pet is diagnosed with a bacterial skin infection…have no fear, we are here to help you! For treatment of a bacterial skin infection, your pet may be prescribed oral antibiotics and it is often recommended to use topical antimicrobial treatments as well. It is crucial to always complete the prescribed course of antibiotics. Incomplete courses or frequent courses of oral antibiotics are known risk factors for development of antibiotic resistance. Topical therapies are just as important, as we can sometimes resolve bacterial skin infections without the need for systemic antibiotic therapy. Medicated shampoos, sprays, mousses, and wipes are all variants of topical therapies. We know that applying topical therapies and performing frequent bathing can be daunting and time consuming, but diligent topical therapy can allow resolution of skin infections without use of systemic antimicrobial therapy. If we can use systemic antibiotics less frequently we have less chance of developing antibiotic resistant infections. Another important piece of information lies in the fact that bacterial skin infections are really just another symptom of an underlying disease process affecting the skin. Some of the most common diseases that predispose to development of skin infections are flea allergy dermatitis, environmental allergies, food allergies, yeast allergy, or endocrine/hormonal diseases. Bacterial skin infections in your pet will continue to be a recurrent problem until the underlying disease process has been diagnosed and managed. Many clients often wonder why their pet’s skin infection needs to be rechecked. Clients often say, “my pet’s skin lesions are gone so why do I need to come back in?” Just because you as a layperson don’t see any lesions does not mean that the veterinarian can’t find any. Many times, there may still be some subtle remaining skin lesions present that were not noticed at home(especially in our dogs and cats with very thick or long coats). It is very important that pets are seen for their recheck exams so the veterinarian can confirm the infection is completely cleared. Once the bacterial skin infection is cleared, then we can tackle the most important task at hand - diagnosing the underlying dermatological disease and managing your pet’s skin condition to prevent further recurrence of bacterial skin infections. Oh No, Not a Diet Trial! During the allergy workup, a test called an elimination diet trial is often recommended. Sometimes this recommendation makes pet owners visibly cringe! We understand that changing your pet’s diet can be time consuming and stressful. However, we still make the recommendation because elimination diet trial and food re-introduction (food challenge) is the only reliable way to diagnose or rule out a food allergy in pets. Unfortunately, food allergy tests are not accurate. We hope the following information will answer some questions about diet trials, and maybe give you some useful tips that you can put into action during your pet’s diet trial. Elimination diet trials can be a failure from the very beginning if the diet selection is not appropriate. When we prescribe elimination diet trials, we only recommend using either home prepared novel, limited ingredient diets or prescription novel, limited ingredient or hydrolyzed diets. Although they are often hyped, over the counter limited ingredient diets are not acceptable for an elimination diet trial. Protein ingredients not listed on the pet food label have been repeatedly documented in over the counter limited ingredient foods, making them problematic for use in elimination diet trials. Process some of the prescription kibble in a food processor, then add water to make a “wet food” consistency, which can be used for giving pills or mixed with dry kibble for a different texture. Check with our staff about using fruits or vegetables for treats – things like baby carrots or apples may be allowed during your pet’s diet trial. Just remember– no grapes, raisins, or onions…these are toxic to pets! Many of the prescription diets come with prescription treats. Vegan marshmallows are great for pill administration during an elimination diet trial. If your pet has already been prescribed a prescription diet for another health problem, we still have options! Some of the newer prescription diets have been specifically formulated for dogs and cats with more than one medical condition. For example, there is prescription foods that addresses both food allergy and kidney disease. These special prescription diets allow us to perform a true elimination diet trial without neglecting the dietary therapy prescribed for a patient’s other medical conditions. Be sure to ask our staff or your pet’s dermatologist about acceptable flea/tick and heartworm preventatives during the diet trial. We have seen patients who have such severe food allergies that the flavoring in their monthly preventatives can cause any itchy allergy flare! An elimination diet trial will typically last about 6-8 weeks. If a diagnosis of food allergies has been made, some pets may eventually be able to transition to an over the counter limited ingredient diet for long-term use. Your pet’s dermatologist can talk with you about the diet challenge process, in which new foods are introduced to your pet systematically, in a way that allows determination of individual sensitivities and tolerances. If you have chosen to make a home-cooked diet for your pet’s elimination diet trial, you can still go through the diet challenge process with the goal of finding an over the counter pet food for long-term use. Or, if you want to continue to cook for your pet, talk with our doctors about making sure the home cooked diet is nutritionally complete and balanced. Performing a true elimination diet trial can seem like a pain, but obtaining a proper allergic diagnosis always makes it worthwhile in the end. With school starting, summer coming to an end and allergy season winding down you may be breathing a sigh of relief. However, fall is the worst season for fleas and ticks! Usually, fleas are not seen on our pets until the flea population is very high. However, every time your pet goes outside they have potential to get flea bites. Flea eggs are carried by most furry creatures (opossums, skunks, raccoons, feral cats, etc.) and fall off these critters as they pass through our yards. The eggs will hatch into a larva and then spin a cocoon. Adult fleas are triggered to hatch from their cocoons by the vibration of an animal walking by. Once the flea hatches it jumps onto the animal and bites. As the weather cools the fleas and ticks are very happy. They like moderate temperatures and humidity (don’t we all). So do not forget your flea and tick prevention as autumn nears. You may have heard the term “mange” used to describe various types of skin problems, but what does a diagnosis of mange really mean? Mange is a layman’s term used to describe a mite infestation. The two most common types of mange seen in dogs are Demodectic mange (demodicosis) and Sarcoptic mange (scabies). Demodectic mange is an overgrowth of Demodex mites. Symptoms include hair loss, comedones (blackheads), redness of the skin, and sometimes scabs and pimples. In severe cases we can see swelling, oozing, bleeding skin lesions, and enlarged lymph nodes. Demodex canis and Demodex injai are the mite species most commonly involved in canine demodicosis, and they reside in the hair follicles and sebaceous glands in the skin. All dogs have a small resident population of Demodex mites; colonization from mites living on the mother’s skin occurs in puppies shortly after birth. Most of the time, the dog’s immune system keeps the mite population in check, and there is no resulting skin disease. In certain situations, the immune system is no longer able to control the mite population and we see mite overgrowth and skin disease. Fortunately Demodex mites are species specific – canine demodicosis is not contagious to humans! There are two forms of demodicosis- localized and generalized. The definition is somewhat flexible, but in general we consider the disease to be localized if there are 5 or fewer focal lesions on the body, otherwise it is considered generalized disease. The disease can also be classified based on the age of onset – juvenile onset demodicosis occurs in dogs around a year of age or less. If the disease symptoms begin later in life we consider it to be adult onset demodicosis. The diagnosis of demodectic mange is made by finding mites on skin scrapings. Treatment of Demodicosis is evolving dramatically. In the past, medications like amitraz (applied topically as a medicated dip) and ivermectin were the mainstays of therapy. Both of these medications have potential to cause significant toxic side effects in some patients. Bravecto (fluralaner; Merck), NexGard (afoxolaner; Merial), and Simparica (sarolaner; Zoetis) are isoxazolines – these three products are safe, effective, and FDA approved medications for oral administration to dogs for prevention of fleas and ticks. Recent research has shown that the isoxazolines also have anti-Demodex mite activity. Sarcoptic mange, or scabies is the type of mange that gives us the “creepy crawlies.” Scabies is caused by an infestation of the mite Sarcoptes scabiei var. canis. Scabies mites live in the superficial layers of the epidermis and are highly contagious between dogs! Sarcoptes scabiei var. canis prefers a canid host, however these mites can transiently infest and cause symptoms in some humans. Scabies mites are typically contracted from direct or indirect contact with other dogs or wildlife such as coyotes and foxes. Symptoms of scabies include moderate to severe itching, hair loss, scaly skin, redness, and crusting. The ear margins, elbows, and hocks (ankles) are sites where we often see skin lesions in dogs with Sarcoptic mange, however the lesions can be generalized. The diagnosis of Sarcoptic mange is confirmed by finding mites on skin scrapings, however these mites can be difficult to find, and dramatic skin disease can be caused by a very low number of mites. Because of this, we often treat dogs for scabies based on clinical suspicion. The only way to 100% rule out scabies is to treat the dog! When treating for scabies, all dogs in the household must be treated in order to eliminate the infestation. Some dogs do not display significant clinical symptoms even when carrying scabies mites, so it is critical to treat all household dogs regardless of whether or not they seem itchy. Revolution (selamectin; Zoetis) is a safe and effective topical medication that is FDA approved for prevention of fleas and heartworm and the treatment of Sarcoptic mange in dogs. At this time, Revolution is our mainstay of treatment for dogs with scabies, however with the release of the isoxazolines as discussed above for demodicosis, we may someday have evidence that these drugs could be used for treatment of scabies as well. One of the things that makes Animal Dermatology & Allergy really stand out is the exceptional quality of our staff. Having a great team of staff members allows our doctors to provide the absolute highest quality of medicine to our patients, and allows us to provide our clients and patients with highly individualized attention and service. We’d like to take some time this month to introduce you to our skilled and experienced staff members. The first faces you will see when you walk in the door belong to Lindsey and Lisa, our receptionists. Lindsey is our primary receptionist and has been with ADA since November 2014 and has spent over 10 years working in the veterinary field. We really depend on Lindsey’s superior communication and organizational skills. One thing that Lindsey enjoys about working in veterinary dermatology is getting to see the improvement in our patients from visit to visit. She also likes getting to chat with pet owners about how their fur babies’ quality of life has improved since coming to Animal Dermatology & Allergy. Lindsey and her boyfriend have four pets: two Corgis- Doug and Tilly, and two cats- Raiden and Ms. Puss. Outside of work Lindsey spends time hiking and trying to rock climb. She has a twin sister who is 7 minutes older than her. Lisa started at ADA in 2007 and has been working in the veterinary field for 9 years. Lisa is our part-time receptionist and over the years has been a reliable and dependable part of our team. If you visit our clinic on a day that Lisa is working you will notice that she always has a smile and a kind word for our clients and has a quiet, gentle way with our patients. Lisa enjoys the satisfaction of helping out pet owners and watching our patients improve over time to experience a better quality of life. At home Lisa has a pretty busy life- she and her husband have two active boys ages 12 and 15 and two 9 year old dogs (Labrador retriever and a border collie/Aussie mix). She has lived in the Sacramento area her whole life. Lisa enjoys photography, and she and her family spend time hiking with the dogs, and going to the boys’ baseball and football events. When you bring your pet in for an appointment you will initially meet Jessica or Juliann, our veterinary technicians. Jessica and Juliann work closely with Dr. Cannon and Dr. Sakai; they often speak with pet owners to get updates on patient progress or answer questions about medications or special diets that the doctors have prescribed. Jessica has been with ADA since February 2010 and she has been working in the veterinary field for 16 years. She has worked in both large animal and small animal veterinary practice and her experience adds an important dimension to our team. Jessica cares deeply about maintaining a standard of excellence in our practice, which shows through in her dedication and hard work. Jessica particularly appreciates working with different dog breeds, and is very knowledgeable about breed-specific skin and coat properties. She also looks forward to learning about new advances and growth in the field of veterinary dermatology. In her free time Jessica and her husband enjoy camping, riding horses, fishing, shooting, and riding quads. They have a variety of pets – Fuller (1 and ½ year old pit bull terrier), Lucky (14 year old pit bull terrier), Cody (29 year old quarter horse), and Kitten (17 year old domestic medium hair). Jessica has held two past rodeo queen titles and once was the overall swine showmanship winner in the state of California. Juliann received her registered veterinary technician certification in 2012, and joined ADA in 2013. She has spent 5 years working in the veterinary field. Juliann has an upbeat personality and is always cheerful, empathetic, and caring. She is a great communicator and our clients and patients love her! Juliann finds it rewarding to observe the before and after transformation in our patients and to see the joy in our clients, especially in the severe cases where treatment “brings back” the pet they used to know. Juliann has one dog at home – a 5 year old Chihuahua named Skittles. Juliann and her fiancé spend time outside of work watching her son’s sports activities, having family movie nights, and watching hockey games. Juliann is currently working towards a veterinary technician specialty certification in dermatology. She plans to take the certifying examination in 2017, and will be among the first group of technicians in the country to attempt this prestigious national certification. Next time you visit us, we hope you will have a new appreciation for our staff members – we can’t say enough good things on their behalf. Animal Dermatology & Allergy wouldn’t be what we are today without them! While flea and environmental allergies (Atopic Dermatitis) account for the majority of skin allergies, food allergies account for about 15% of allergies in pets. There is a lot of misinformation about food allergies and foods for our pets. Here are 6 True or False questions that relate to food allergies, with the answers and explanations following. All of the above are false! 1) The most common ingredients that dogs and cats are allergic to in their diets are chicken, beef, (fish- cats), dairy, egg, wheat, and corn in roughly that order. Two scientific studies have demonstrated that some over the counter “limited ingredient diets” contain chicken, beef, and soy – ingredients that are not indicated on the labels. So, unfortunately changing to different diets that you can find over the counter may not help diagnose or treat a food allergy. 2) If a dog or cat is allergic to say chicken, then he/she will be allergic to chicken whether it is raw, cooked, organic, chicken meal, or chicken byproducts. They are all sources of chicken. 3) At veterinary emergency clinics dogs are frequently seen for “food poisoning.” There have also been reports of people getting food poisoning from handling raw pet foods (JAVMA 2001, 219:9; JAVMA 2005, 226:2). 4) Yeast skin infections are very common in allergic pets, especially dogs. The yeast that normally lives on the skin of both dogs and cats is Malassezia. Unlike Candida yeast, Malassezia does not live in the intestines and is not kept under control by the gram positive bacteria in the intestines. So all the carbohydrate and sugar restrictions and ProBiotics will not affect the Malassezia yeast living on the skin. The carb and sugar free “anti-yeast” diets were developed for humans having problems with Candida yeast which lives in the intestines. Unlike Malassezia, Candida does “feed” on the sugars in the intestines and is kept under control by gram positive bacteria that live in the intestines. Atopic dermatitis is an allergic disease syndrome in which exposure to environmental allergens leads to an overzealous immune system response. This results in itchy skin and ears, which dogs and cats will demonstrate by scratching, licking, rubbing, and biting at themselves. As we talked about in the previous blog entry, common allergic triggers in the environment include dust, dust mites, pollens, environmental molds, and insects. Symptoms of atopic dermatitis may be year round or seasonal, depending on the individual animal’s allergic triggers. Arriving at the diagnosis of atopic dermatitis can be a long process because it is a diagnosis of exclusion. This means we come to the diagnosis of atopic dermatitis by first ruling out all other causes of itchy skin disease. Many times we do not arrive at the diagnosis until your pet has first undergone a 6-8 week strict elimination diet trial to rule out food allergies, a parasite treatment trial, and/or treatment of yeast or bacterial skin infections. This is something we hear a lot! Allergy testing can be very valuable, but it is not used for initial diagnosis of allergies. For one thing, food allergy tests are notoriously unreliable and test results often do not correlate with a patient’s clinical response to foods. Our dermatologists do not recommend food allergy testing. Allergy testing for environmental allergies is something we perform frequently, but only after we have already come to the diagnosis of atopic dermatitis (see above). The test should not be used as an initial diagnostic tool because as with any test, allergy tests may occasionally come back with false positive or false negative results. For example, if you performed the test for environmental allergies on a group of pets with only food allergies (or even a group of pets with no allergies at all), a few of these pets would probably test positive for some environmental triggers. The appropriate use of allergy test results is in creating allergen sera for immunotherapy (aka desensitization therapy). Atopic dermatitis is a condition that is treatable, but not considered curable. Pets with allergies will likely need some sort of allergy treatment regimen for the rest of their lives. Mild allergy symptoms can sometimes be managed with antihistamines, topical therapies, and supplements. There are currently four treatment options for pets with moderate to severe atopic dermatitis: long-term steroids such as prednisone, a medication called Atopica (cyclosporine, Novartis), a medication called Apoquel (oclacitinib, Zoetis), and desensitization immunotherapy. Each treatment option has certain benefits and drawbacks- there is no perfect treatment option. Long-term steroid therapy is the least ideal option. This treatment option should be considered an option of last resort- to be used when other treatments have failed. When used long-term, steroid medications have the potential to cause detrimental side effects, and may even shorten the lifespan of your pet. Atopica is a non-steroid medication that is very effective in the treatment of atopic dermatitis. It has been approved for use in the treatment of atopic dermatitis in veterinary medicine since 2003. Apoquel is a brand new medication with promising initial results. This medication was approved for the treatment of allergic skin disease in dogs in 2013, and was released for clinical use in 2014. Soon after release, Apoquel unfortunately went on manufacturer backorder. The backorder is expected to be lifted sometime in 2015. The main limitation of Apoquel so far is that we have limited long-term safety data and limited experience with the medication (since it is such a new medication). Immunotherapy, or desensitization therapy is the only non-drug treatment option that has been shown to produce significant improvement in clinical symptoms of atopic dermatitis. Immunotherapy involves administration of tiny amounts of allergens in attempt to change the way the immune system responds to these allergic triggers. Allergens can be administered by injection (allergy shots) or they can be administered under the tongue (sublingual immunotherapy- SLIT). Each pet’s immunotherapy serum is unique, and is created based on the results of the pet’s allergy test. Although diagnosis and treatment of atopic dermatitis can be time consuming and complicated, most pets can be managed successfully. Our goals in treating atopic dermatitis are to reduce the severity and frequency of allergic flare-ups and to help your pet live a happy, comfortable life. When your pet is diagnosed with atopic dermatitis, the dermatologists at ADA will discuss the details of the treatment options with you and help you choose the best management plan for your pet.